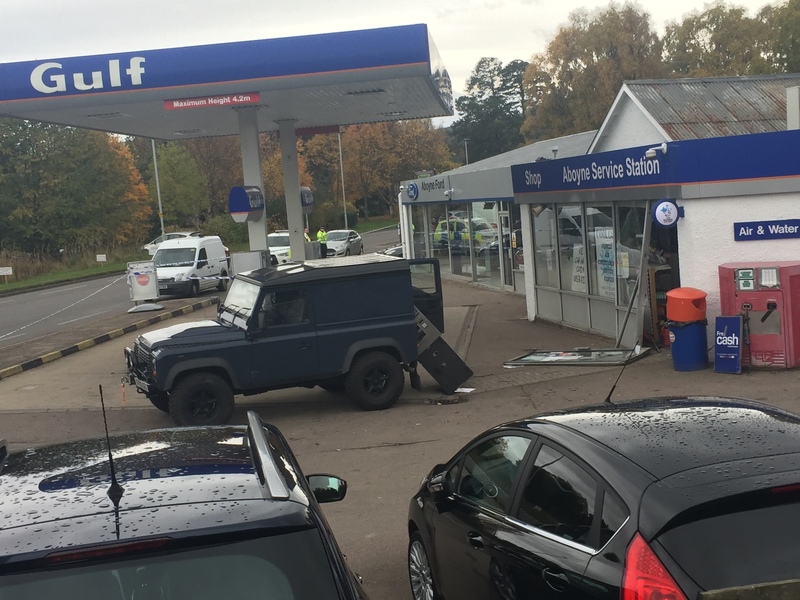 Bungling raiders tried to steal a cash machine from a north-east petrol station – but ended up fleeing empty handed and leaving their getaway car and the ATM behind. 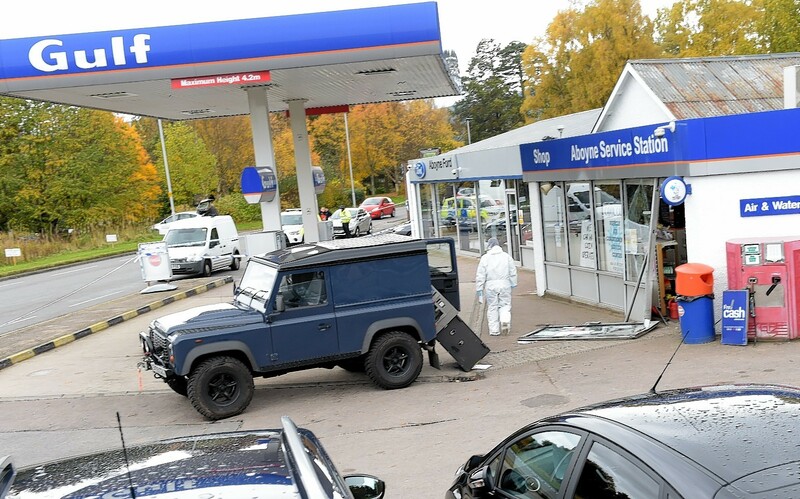 The would-be thieves smashed their way into the premises, dragged the freestanding Link dispenser on to the forecourt and tried to load it into a navy Land Rover Defender. But they only managed to get it half into the 4×4 before abandoning the heist and making off. It is thought they may have been disturbed in the middle of their ill-fated raid. 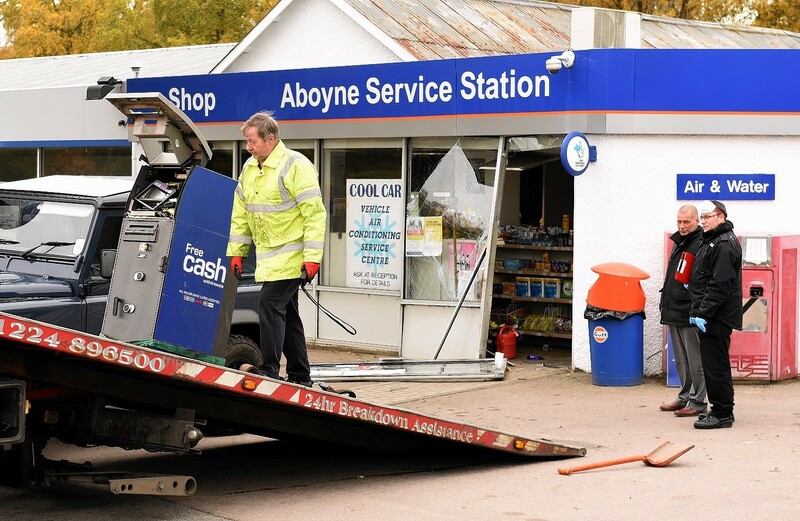 They struck around 1.45am yesterday at the Aboyne Service Station on Deeside. 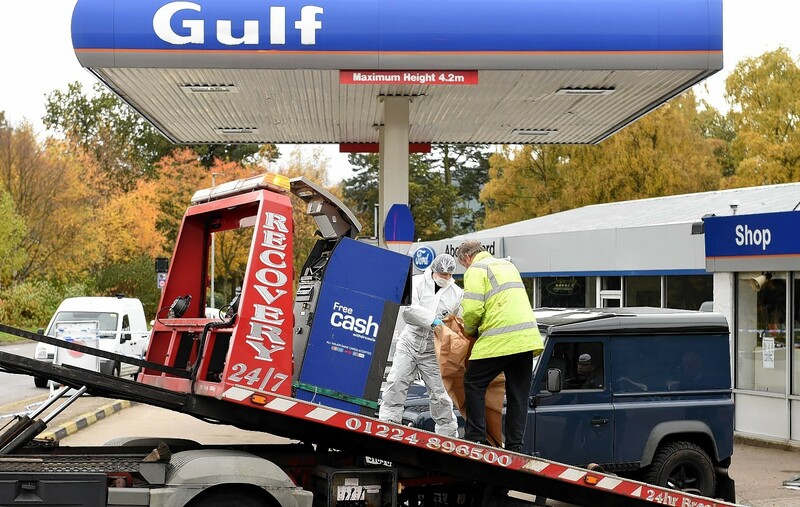 Yesterday, the scene of the incident was cordoned-off with police tape and forensic teams were examining the Land Rover and the ATM. Police were also checking CCTV from the premises. 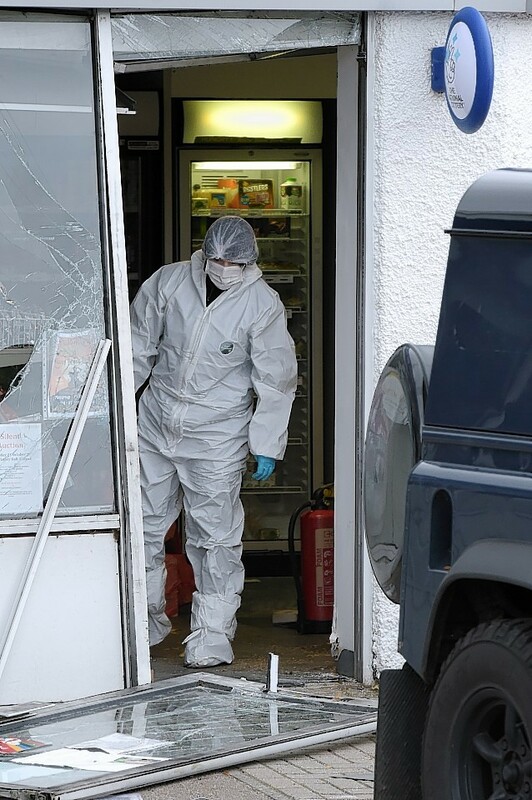 The incident was the latest in a string of ATM raids in the north-east and fears were raised last night that the area was seen as a “soft target” by criminal gangs. 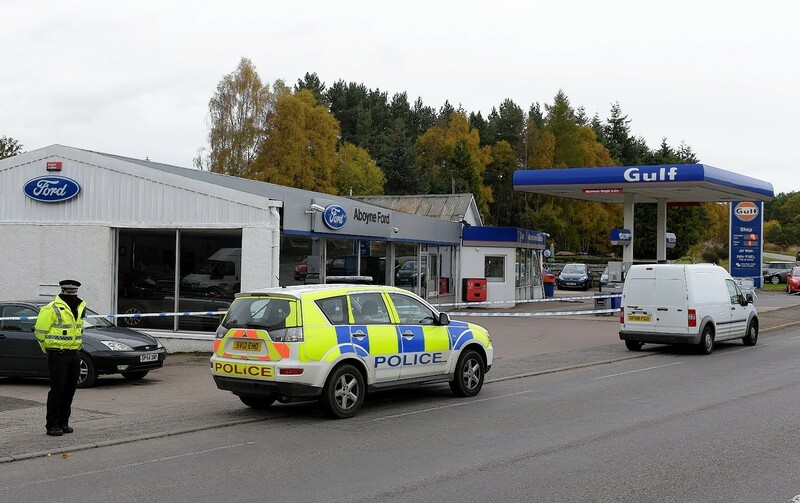 Aboyne Service Station manager, Angela Cofre, said she was stunned to arrive at the premises in main Street yesterday morning to find herself in the middle of a crime scene. She said: “I had no idea what had happened. “I presume they broke the door and tried to yank it out. We have CCTV, and I think we’re working with police on that. Aboyne councillor Geva Blackett said: “There certainly seems to be quite a lot of shock. In January, two ATMs were torn from the wall of the Morrisons store in Banchory, and £10,000 was stolen. 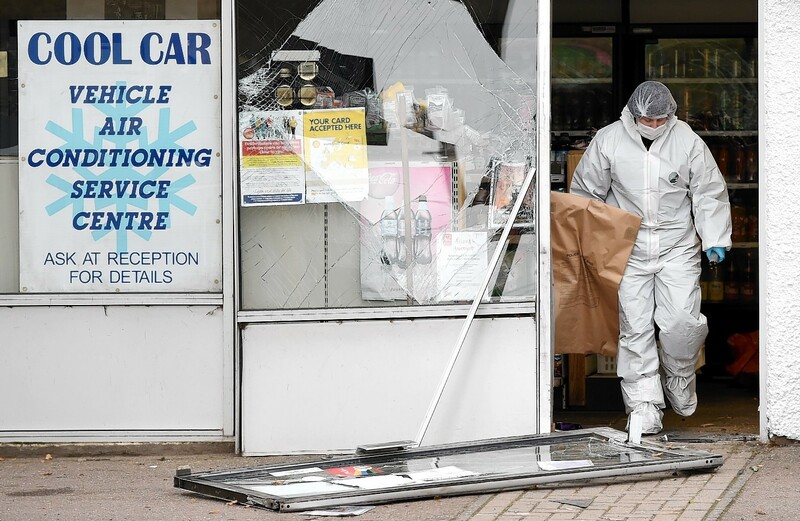 Nearly £1,000 was stolen from a cash machine at a Nisa store in Cuminestown in March, while in June thieves made off with about £50,000 after blowing up an ATM at Tesco’s Newtonhill branch. Most recently, in August, raiders stole more than £10,000 after smashing a cash machine at the Co-op in Kingswells. 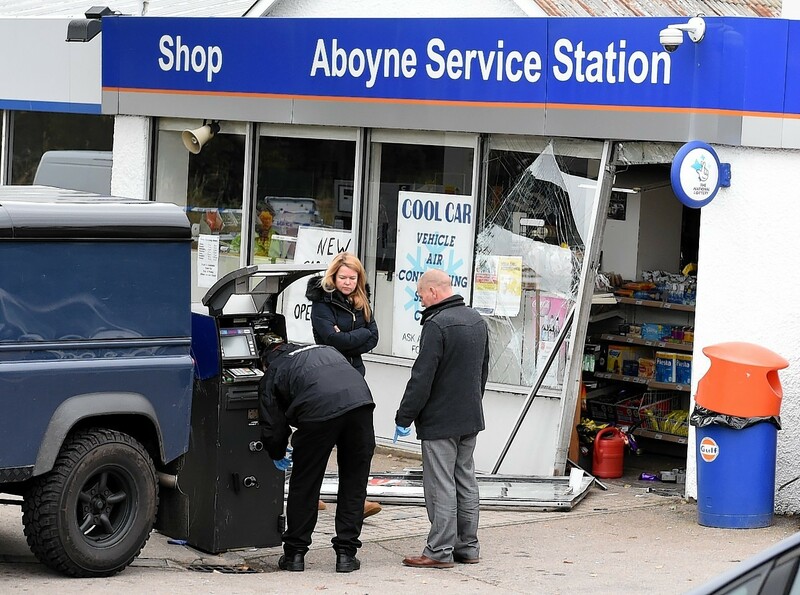 It is thought ATMs in Aberdeenshire and on the outskirts of Aberdeen are being targeted because of their remoteness, which provides criminals with opportunities for cleaner getaways and fewer witnesses. North-east Labour MSP Lewis Macdonald said he suspected the culprits were not from the north-east. He said: “You have to wonder if the criminals are targeting these quieter communities intentionally, where there are fewer people on the streets and less risk of them being disturbed when they are committing the crimes. A case like this shows why. “At the end of the day criminals will always hit the weakest point that they can, and people that run businesses like this will want to see what security they can put into place, be it CCTV or the like. “I think this is a real problem locally, however I don’t think the perpetrators are locally based. Detective Inspector Richard Taylor appealed to anyone with any information about the Aboyne incident to contact police. “A dark blue Land Rover vehicle was used in the commission of this crime and was then left at the scene,” he said.